The conclusion of the great fantasy of our time. These books are richer, more coherent, and far braver than Harry Potter. In a sensible universe, Lyra would share the spotlight – and no doubt she does in Lyra’s Oxford. Pullman uses his scope to terrific effect; Lyra grows up in the course of the book, and the changes are organic – not simply new concerns and responsibilities but subtle shifts in attitude and speech. Unlike so much modern fantasy, these are books of ideas, not merely stories of good people who faced extraordinary challenges. These books argue bravely that the world is a grand combat not between good and evil, but between wisdom and stupidity – and that the pieties and institutions that clothe themselves in the banner of goodness, religion and sentiment, inhibition and self-denial, are in fact the forces of stupidity. Milton was of the devil’s party but did not know it; Pullman makes the case. The date of the dinner party arrived on they day of the hurricane, and so now we have the story of the Hurricane Irene dinner to accompany the memorable Norwegian Blizzard dinner. It’s good to cook for people with appetite. The first course was gazpacho, I made a batch and a half, and none was left. I brought out a bottle of Chablis to go with it, and when I went to grab the next course it was delightful to see that we were ready for the next course’s wine. The house did not blow over, or move to Kansas. Snacks and first aid. Dark and Stormies were planned, but people wanted a Last Word, and so we had Last Words. Linda made retro onion dip and veggies. I made some corn muffins – madeleines, really – with the excellent local corn. Salmon, spinach, and shrimp mousseline, garnished with the mushrooms that ought to have been in it. (Mark at midnight: “Hello, mushrooms. What are you doing here?”) Lacryma Christi. Enchiladas made with fresh corn crepes – tasty local corn again, duck confit, and barbecue sauce, from a Michael Symon / Michael Ruhlman recipe. The sauce exhausted all my remaining veal stock and demi-glâce and was worth it. Served with grilled banana and bits of pork belly. (The pork belly was rubbed with spices, braised in chicken stock for at least six hours, chilled, cut into little squares, and then gently pan fried for another two hours. There were no leftovers.) Burgundy (terrific) and also a lovely Grauer Burgunder, because a guest couldn’t decide which would serve better and brought both (hooray!). Each was terrific. Caramel braised Jetstar tomato, stuffed with season’s first apples, fresh green figs, fresh cherries, ginger, pecans, pine nuts, vanilla bean, cinnamon. With freshly-made basil ice cream. Sauternes. Normally, a braised tomato becomes tomato sauce. (‘The limitations of this insight,’ one of [Alain] Passard’s admirers has noted gravely, ‘describe the limitations of Italian cuisine.’) To make a tomato get sweeter without falling apart not only is technically demanding but demonstrates, with a stubborn, sublime logic, an extremely abstract botanical point. Tomatoes are not vegetables; they are fruit. It’s a bit of bother to make, but this is the time of year. Although much discussed on the Web, moreover, I was unable to discover whether this dish is intended to be served hot or cold. I think the hot dish was better, but that would be an even greater high wire act – and there’s a lot that can go wrong here. But it didn’t. And we finished the whole batch of basic ice cream. Another Facebook critic of Next Restaurant, Kimberly Small, is seething because her chicken wasn’t. “Uncooked butter poached chicken...’ You are implying, via your insinuations, that food is open to interpretation. I disagree. The overall presentation? Maybe. But the execution of the food? Absolutely not. It doesn't take a genius to know good technique. So please, with all of your fluff, please explain to me your opinion of such a fine restaurant serving uncooked butter poached chicken. They took my beloved suprêmes de poussin (poached chicken), sliced the breast into a diamond shape, and coated it with sauce blanquette. Magnifique! Curiously, they also poached two cucumbers in butter, wrapped them in salt pork, and supplanted the seeds with chicken mousse. I still do not understand how. A friend of mine, a conductor, was called to fill in for an ailing colleague who was slated to conduct a concerto my friend knew well. He said he also knew the soloist. “My job,” he said, “is to make the soloist’s interpretation – a mistaken interpretation – as clear as possible.” Let’s not ask whether we like this dish, but rather, why is the dish as it is? What is going on here? And what might have led Ms. Small to think it simply uncooked? There is the possibility of sheer error. Perhaps something went wrong in the kitchen. Perhaps someone made a terrible mistake and nobody noticed. That’s a possible interpretation, and in that case the dish is simply saying “Someone has blundered.” But perhaps the dish is prepared this way for a reason. What might it be trying to say? The menu reads “Paris 1906” and the course is Escoffier 3130, but nobody at the Ritz Hotel prepped or plated it like this. One glance tells us that this dish is performed in modern dress: it is indeed an artfully cut piece of chicken, very gently cooked – Escoffier is emphatic that the breast must never touch hot water and must not be overcooked – and sauced. But this is not belle epoque! What’s the story? First, obviously, we’re playing with the east and west. The plating suggests Japan. Those cucumbers suggest maki rolls. So, perhaps the chicken is taking the role of sashimi? That wouldn’t be too far from Escoffier’s intent, which is clearly to preserve the tender texture of the delicate meat. (If you want richer flavor, he’s got plenty of browned chicken preparations on the next page.) We’ve got white meat, a pale sauce, green cucumber, greener fennel, and the pale forcement: we’re thinking of color, clearly, as well as taste and texture. The geometry is a clue, too: this plating is High Modernism – not the style of the Ritz, but Leger (who was 25 in 1906) and Braque (who was 23) might see the point. Second, why do we so seldom cook from Escoffier today? What inspired nouvelle, to which this plating also alludes, and then gave rise the experimentalism of French Laundry, Alinea, and El Bulli? Two things, I think: the old recipes were tired because we had eaten them too often and cooked them too long, and the old recipes were tired because they were overcooked. California, land of fresh vegetables and sanitary, looms large here: in the 1980s we rejected overcooked food because we weren’t worrying anymore about cholera and trichinosis. In 1906, the whole world seemed to be a Third World country and the elites who ate at the Ritz knew it. They liked their food, but penicillin was still thirty years in the future. An undercooked dish could kill you, and often did. But that’s not the way we cook now. As I understand it, that chicken is cooked sous vide — very, very slowly, more slowly than Escoffier’s people could possibly have managed — with an eye to being precisely done throughout. If you’re used to traditional prep, this is going to seem undercooked because the exterior isn’t overcooked. The sauce blanquette is going to emphasize the effect. So on this plate — without tasting — I think we have two interesting ideas. We have the fascinating question of: what is cooked? And what is overcooked? This involves taste, texture, and biology, and its parameters have changed in the century that separates us from Paris 1906. Yet the underlying concerns are the same, and they connect us to Escoffier and his clients Read the text: Escoffier does want to be very careful not to overcook that chicken. And then we have our memory of the past refracted by our knowledge of the world, things we know that Escoffier didn’t. Almost none of Escoffier’s patrons had ever tasted pad Thai or picadillo or wasabe or vodka, just as none of them had been more than 324m above ground level, driven a car, read Lady Chatterly’s Lover, or listened to Le sacre du printemps. But it’s not that long ago; my reading teacher was born in 1907, we all have met people who might, had they had the money, have stayed at Escoffier’s hotel and eaten his food. So we have the idea of Escoffier 3130 and its ingredients, deployed here to a new effect with new means for a new time. And maybe you don’t like this chicken. Maybe you’d like it browned and served with rice and beans. And maybe you’d like Hamlet to have more girls and better jokes. This isn’t about what you want. Mr. Achatz and Mr. Beran are on the stage, and we’re here to listen and to understand, and maybe then to weigh their ideas and to take action. It’s been amazing to watch. They’re fine machines and they run terrific software and they continue to move us forward and to make us better. Over on Facebook, a lively discussion of Next has led Jeff Moyers to think I’ve lost my marbles. I am also surprised to see so many people (seemingly) taking offense at the fact that some of us had bad food, bad service, and/or bad experiences at Next....as if my comments concerning were directed at them personally. Why is this? Why do you care so much about our experiences? You didn't wait on us, you didn't prepare our food, so what gives? If your experience at Next differs from ours, what's it to you? Just saying" 100% "of the people you know who have gone to Next had perfect experiences there doesn't (and won't) change our experience nor our opinion. So shut-up already. Moyers is vexed by the ticketing system. So is everyone. That’s an interesting technical problem about which I’ll likely write more in a bit, but that core problem is that he didn’t find the experience quite right. Even the New York Times said the food at Next ‘wobbles’ and at those prices food cannot ‘wobble’. The last thing I want to do after going to dinner (especially at those prices) is to find myself hungry an hour or two after the meal has concluded. That last bit is, I think, just a reflex slam at Asian food. Almost all the sterner critics in this thread fixate on cost, and I fear that a lot of anger is simply outrage that an Asian restaurant – and Next is Asian for the next month or two – wouldn’t be cheap. If you go to a restaurant because you’re hungry and you want to eat pancakes, then what matters to you is the pancake. If you go to a very expensive restaurant because you want to eat pancakes, the pancake should be well prepared and well presented. You’re paying for the pancake, and you are paying enough that the restaurant should take great care to please you and to make sure you are not inconvenienced in any way. In this view, restaurants are a service. Some restaurants try to explore what food means, to make us reflect on food and eating just as painting invites us to think about what we see, and theater wants us to think about people we know. This might not always be entirely comfortable or predictable; a terrific painting might not be pretty, and good plays often portray people you really wouldn’t want to know. The analogy isn’t exact because, after all, you are eating: you can endure Endgame from the fifth row, you can look at Los Desastres de la Guerra on the wall, but eating something that unpleasant would be intolerable. Still, food can say a lot, and some people want to make it speak to us. In this view, restaurants are a performance. if we always understand it completely, it’s not challenging enough. if we know exactly how it should be prepared, we know it all and there’s nothing for it to say. fresh experience is not ritual. When the experience is fresh, we don’t know what to expect – and the performers cannot know, either. Refinement that makes sense in a well-known context – the classical French country destination restaurant – is possible only where both patron and server know exactly what should happen. What is Next’s Tour of Thailand about? I think, fundamentally, it explores new abundance built on a long tradition of contested frugality. This shows up in the elegant street food and the extravagantly basic curry, in the intricate (but uncharacteristic) composed dessert followed by the simple dragonfruit set off by a shared rose. This can be done in other media– some Dutch genre paintings come to mind– but it’s an idea that lends itself to food. You could do it with other cuisines – Achatz has talked about doing a menu from wartime Italy, and you might do amazing things with Jewish cooking in Vienna or Warsaw or Minsk circa 1931. But Thailand is makes a lot of sense, not least because, in Asia, it’s so often been all about having enough to eat. The city of ancient Rome began as a small settlement amid rolling hills and a meandering river. By the time of the early Empire, it was home to a lot of people – probably around a million. It was the largest city the world had known. It is also the ancient city we know best, really the only pre-modern city for which we know any number of the inhabitants as individuals. Dyson seeks to repopulate the historical city, focusing not just on the monuments but on the people who worked in their shadow. 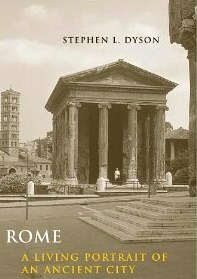 The first chapter, on the historiography of the city, is fascinating, taking special care to observe how Enlightenment scholars like Gibbon torqued the story of Rome in one direction, how Fascist Italy pulled it in another, and how the biases of right-wing European politics affected such familiar sources as Carcopino’s Daily Life. One could wish for more illustration, though I particularly like the way Dyson uses personal snapshots to show us ancient Roman buildings embedded in the fabric of the modern city. Next is a fascinating Chicago restaurant that serves a single, fixed menu that changes every three months. You don’t make reservations; you buy tickets. The current menu is titled “Tour of Thailand.” It’s full of fascinating ideas. Next is owned by Grant Achatz and Nick Kokonas, the cerebral pair who created Alinea. 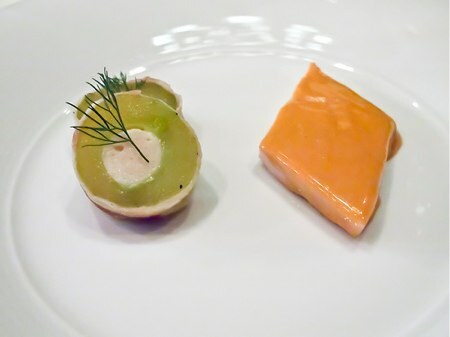 A few years ago, I wrote a piece about one dish: Alinea: What the Pigeonneaux a la Saint-Clair are saying. Next is not pushing the same boundaries as Alinea, but there are lots of ideas in every course. Street food: served on a table spread with fresh Thai newspapers. Roasted banana, a prawn cake, a tasty sweet shrimp, a piece of sausage, a steamed bun. All paired with a cocktail based on Batavia Arrack, guava, and mango. The roasted banana was particularly complex and unforgettable, but this is all nifty food. Asian street food is a problem: you don’t get it in the US, and eating on the street still feels chancy in the third world. There’s always Singapore, where the street food is immaculate, but this is a wonderful course. Hot and sour broth, pork belly: familiar thom yum soup, redolent of chillis and lemongrass, kicked up a notch and garnished with an amazingly lean piece of pork belly. This seems a simple course, and you might think it’s more delicious just because they use better spices. I suspect there’s a lot going on here; I bet that pork belly, for example, is cooked sous vide for a very long time, and I bet there’s some quiet molecular wizardry going on with the broth, too. This is Achatz all over: do something really complex and don’t even mention it, letting the dish speak for itself. Paired with a cocktail of gin, chrysanthemum, lemongrass, and lychee. Rice with condiments: just the usual – chili paste, salted duck egg, mango pickles, things like that. Except these didn’t come from a jar. I gather that Achatz doesn’t care for the duck egg, which was my favorite. Catfish, caramel sauce. The advance story for Next promised a visit to 18th century Ayutthaya, the kingdom that preceded Thailand. This dish must be part of that vision, a memory of Thai cuisine before peppers arrived from the New World. Subtle and delicious. Paired superbly with a wine that goes by the unlikely moniker of Itsas Meni Hondarrabi Zuri, Bizkaiko Txakolina 2010. Beef cheek curry. A big, hearty piece of beef cheek, beautifully braised, in a superb curry. Again, we’re taking familiar Thai neighborhood restaurant fare and making it better – not by using fancy ingredients like “Cadillac fajitas,” but by really thinking it through. What makes this dish is that you get one hearty piece of flavorful, perfectly braised and seasoned beef, rather than lots of little bits. Getting it right has got to be tricky, but it makes a hell of a dish. Paired with Half Acre Horizon Ale, custom-brewed for this dish with hibiscus, mangosteen and pomegranate. A terrific pairing – and I am not usually fond of fruit beers. Clarification of watermelon, lemongrass. I wrote about this before. If you don’t pick up on the hint word “clarification”, you’d think this was just an unusual juice. Dessert with corn, egg, licorice, service in a young coconut. A very elaborate composed dessert, worthy of Alinea for its play as well as the complex interaction of flavors and textures. This must be an absolute bear to make, but again you wouldn’t necessarily notice if you weren’t looking at all the different little products mixed together in your coconut. Journeyman in Somerville does desserts with lots of components, but they're on display; at Next, they’re casually tossed in your coconut (though it would not surprise me if the apparent casualness of the tossing is a carefully-cultivated illusion). Paired with Cusumano, Moscatto dello Zucco – a nicely acidic dessert wine. Dragon fruit, rose water, and a rose. Perfectly delicious, served with a long stemmed rose to revive your sense of smell. Paired with Banks blended island rum, served straight. You wouldn't think raw spirit would work this late in the meal and paired with fruit, but it seems inevitable. I want a bottle, and I hardly ever drink rum. Iced tea in plastic bags. Back to street food! Soft drinks in plastic bags are one of the details of being in Asia that you forget when you’re not. Nice bit of theater. There’s lots of thinking here that I can see, and I’m sure I’m missing a lot. By selling tickets instead of taking reservations, for example, Next builds service into the charge and gets rid of tipping. Everyone is on salary, and servers and cooks both receive the service charge dividends. The menu itself is playing all sorts of inside games, moving from street food to elegant dining, from the reconstruction of ancient dishes to the deconstruction of everyday hot and sour soup to fresh construction of a wild composed dessert. And in a couple of months, they’ll do something else! by Holly Black and Ellen Kushner, eds. 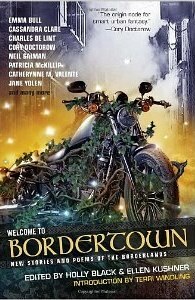 In 1986, Terri Windling put together a successful shared-worlds anthology, Borderland, about a strange city on the border between the world and faerie. This is the Tijuana of fantasy, a land of ruins and dreams where the music is hot, the drugs cheap, the girls are supernaturally pretty, a place where it’s easy to find a squat and easier to find trouble. After a 13-year hiatus, The Way to Bordertown is open once more. In Faerie, only 13 days have passed, which can be confusing when your kid brother shows up and he’s older than you are. The noobs bring wonderful things from The World – mobile phones, wikipedia – which sometimes work on the Border and sometimes don’t. Cory Doctorow contributes a story here about setting up an ISP in a realm of unreliable electronics and the challenges of trying to route packets to Faerie, where no mortal can enter. A core concern on the original stories was the then-famous Problem of Runaway Teenagers. Runaways are not much spoken of these days, perhaps because after Reagan and Bush 43 we’ve simply grown accustomed to them. The new volume has some fine stories, and some interesting poems (including nifty poems by Gaiman and McKillip) that really ought to be songs. No doubt, some fans are already getting out the spellboxes that power the guitar amps and laying down tracks. I’ve been up to my ears in iPhone and iPad programming lately. It’s been a few years since I’ve jumped to a new platform, a new language, and a new framework all at once. Of course, scads of developers and coders and students have been doing the same thing in the last two years. Cocoa Touch, the framework, is remarkably nice and surprisingly easy to learn. There are lots of books to help you get started. Most aspire to be more accessible to beginners than the Apple documentation. Apple’s documentation remains the best resource for people who know what they’re doing – people with an adequate computer science background. If you’re old enough to remember Petzold, this will come as a surprise. Apple’s documentation is too elementary. It tends to avoid useful terms that everyone learns in elementary CS courses. Not everyone, admittedly – I never managed to take any courses. But there aren’t that many old autodidacts like me around the business anymore, and even I can manage to read “call by reference” without bursting into tears. iOS does a remarkable job of hiding its constraints. It’s not easy to know, for example, how much memory you have, or how much you can ask for. You’re encouraged to allocate objects with abandon. It feels like it’s running on a big machine, and the processor does not feel slow. I expected to want FORTH (or something like it), the language best suited to doing difficult tasks in constrained environments. I don’t. Between the pattern-aware framework and tricky memory management, iOS programming has got to be really hard for untrained programmers. I suspect a lot of programs out there simply leak memory left and right and hope for the best. I have no idea how non-technical folk go about hiring iOS programmers; it must be ugly. Many aspects of Objective-C seem awkward, and they are rendered more unpleasant for want of a defense. Why is there no overloading of methods? Why don’t braces create a new variable scope? Are @private methods useful now that we have @interface foo(), or are they just a leftover? It would be nice to read a rationale, and to know what the authors were (and are) thinking. I'm often tempted to bridge to something from STL or BOOST . Are the Core Foundation containers adequate substitutes? When is the unsighliness of the bridge class worth undertaking? What, really, are the drawbacks of Objective C++, anyway? The iTunes App Store makes lots of money and it's a big success. But an awful lot of those apps we see are tiny fripperies with fancy graphics glued on. Long term, that’s a danger to the platform. Now, suppose you’re the product manager. You suspect that you can improve the load time a bit if you have someone spend a day polishing it. Is it worth the money to save, say, 10 seconds of load time? Let’s do the math: 1000 users, 10 seconds, twice a day. That’s 20,000 seconds/day. Over a year of 261 weekdays, I believe that’s 1450 hours. At just $25/hr, we’re saving the users about $36,000. At $100/hr – with salary, taxes, benefits, office space and furnishings not as impressive as it sounds – we’re saving $144K. A nice return for a day’s work. If the product manager and the developer went off to Vegas instead and came home with $35K each, they’d be pretty happy and might take the rest of the department out for a steak and a beer. So they’d be happy. The customers still have half the savings in their pocket – and they can use the extra 1450 hours/year to make more stuff and earn even more money. The result seems to be a slew of inexpensive products with polish and limited capability, products that demo well and don’t attempt a lot. We have products like the impressive new Garage Band for the iPad that exist to demo other products. We have buzzword-compliant B2B products that promise vague and indirect benefits. And we have a rush to completely unproductive forms of software investment, like the billions of dollars being poured into buying invalid patents that are intended only to deter litigation from the owners of other invalid patents. The disconnect between the real technical press – Gruber, TidBits, A List Apart, Tim Bray, Martin Fowler, Rands, Shawn Blanc – and today’s magazines and newspapers is nearly complete. As Gruber has long been showing us, there’s no penalty for being wildly wrong in Newsweek or the WSJ; you’ll be invited back to get another big payday to be wrong some more. And there seems to be no penalty for being a jackass – not merely being wrong, but being wrong in a way that confirms your prejudices or enhances your stock portfolio. There’s no penalty at all for being wildly wrong in writing reviews in the App Store. Meanwhile, the bargain basements of the Kindle store are overflowing the scanned “classics” so badly OCR'd that you can’t even be sure they’re in English. We need to find a way to pay that fellow who is going to save us $144,000 this afternoon. We can use that money. To begin, let’s start penalizing the liars. Finding myself enthralled by a BBC Audio production of the Barchester, I put aside the audio and read this long and spirited courtship in which an orphan, having been raised by her uncle the country doctor, discovers her place in the world. Trollope wrote with great facility and precision but was not always concise, and even when he pokes fun at novelistic convention we remain several steps ahead of him as the plot unfolds. Jo Walton’s critique – that the people in Trollope’s novels simply don’t act as people do – in seldom more evident than here, for Austen’s heroines are more subject to love’s lightning strike. 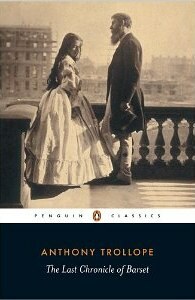 But no one writes better about Victorian home economy, and Trollope’s best scenes are well worth the wait. A growing problem for Amazon’s Kindle store is the glut of garbage editions of out-of-copyright classics. Some are fine, some are sloppy, some are so badly scanned that they aren’t even recognizably English. It’s shameful. I expect the answer is a $100/title listing fee, perhaps refunded after you’ve earned $100 in revenue. But something needs to be done to stem the garbage. In a discussion at this year’s Readercon, Michael Dirda tried to distinguish meatier criticism from the sort of thing for which he is best known, the “book recommendations” collected in Book by Book and Bound to Please. This volume is misnamed – the books it discusses are not all classics and the purpose of reading them is not always mere pleasure – but admirably extends Dirda’s project beyond the sphere of contemporary books for which magazines and newspapers typically publish recommendations. 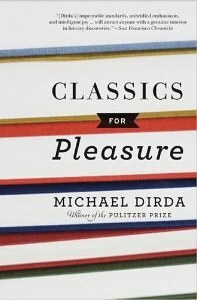 Whether urging the reader to enjoy Kipling’s adventures or Fowler’s Modern English Usage, whether praising Edward Gorey’s macabre illustrated chapbooks or Girolamo Cardano’s Story of My Life, Dirda is always engaging and his judgments are often unexpected. Sam Sifton from the NY Times visits Next, where I ate last weekend. Never fear: I’ll tell you about the food shortly. Another tasty topic at Eastgate right now is the challenge of bringing wonderful titles to new environments. 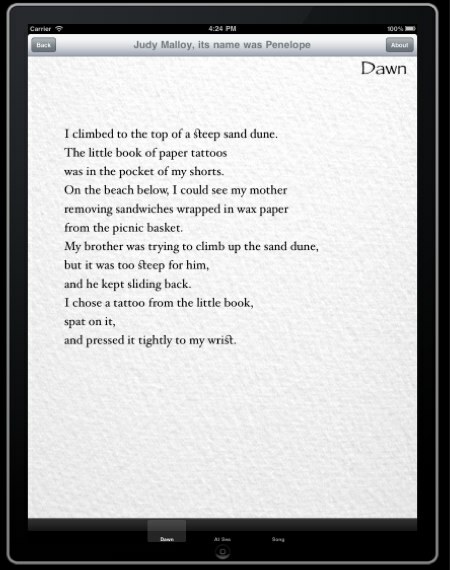 Here, for example, is Judy Malloy’s wonderful its name was Penelope, first published in 1993 and now being reimplemented for the iPad. Fresh implementations raise a host of spicy questions, ranging from typography to critical theory, from garbage collection to museum curation. Moving from click to touch is an important transition, one that invites reflection and planning although we should be wary of analysis paralysis and nostalgia for imaginary pasts. The keepers of the $47,870 directory seem to be getting around to listing a few more Eastgate titles, though they seem strangely concerned with noting that these works were originally served on floppy disk. Funny, too, how those pro librarians have overlooked that “Eastgate” and “Eastgate Systems, Inc.” are the same company. I’m sure they’ll add our iPad editions by 2018. Seriously: the way to preserve electronic literature is to read it, to write about it, and from time to time to refresh the code. The road to stagnation often lies in fussing with open-sorcery and formats when you ought to be making great stuff with the best tools you can find. Malloy sketched the original Penelope in BASIC, which is what she knew, and I rewrote it in 1993 for a the original Macintosh edition. This is all-new code, it’s much nicer, and it was far easier to write. The unabridged audiobook , narrated by Pullman with a full cast, is a triumph. Enclosed is our latest version of Ms. #1996-02-22-RRRRR, that is the re-re-re-revised revision of our paper. Choke on it. We have again rewritten the entire manuscript from start to finish. We even changed the g-d-running head! Hopefully, we have suffered enough now to satisfy even you and the bloodthirsty reviewers. The Journal of Systems and Software 54 (2000) 1. Last weekend, I had a chance to visit Next, the new restaurant from Alinea’s Grant Achatz. It’s a fascinating idea. Next serves one menu: you have no choices. Every three months, they close for a week and reopen with a new concept. The first menu was Paris 1906, with everything from Escoffier. Now, they’re doing a Tour of Thailand, and it’s quite a tour. I’ll discuss the meal in a separate post. As I’ve written before, I think no-choice meals are going to be one of the key new trends for serious restaurants. Choice is great, but when Mr. Achatz or Next chef Dave Beran is cooking for you, he knows more about the food than you do and you’re there to see what he’s doing. This is about smart, interesting food, not about having everything just the way you usually want it. We don’t need all those choices, and paring down the options lets restaurants prepare more intelligently and concentrate on exactly what you’re going to be eating. The no-choice regimen also lets the front of the house concentrate on serving the food and on talking about it. There’s no need to sell, and no need to worry about what’s 86’d and what’s running out. So I asked, “A clarification?” And, yes, it is a clarification: the ingredients are puréed, and then mixed with gelatin and chilled. The gel is put in a cloth bag and allowed to warm back to room temperature where it melts into a sol and the precious, clear liquid gently drips through the fabric. This process actually recalls the “divine droplets” sake we enjoyed at Alinea, which is gently extracted from the must in an ice igloo. It’s very clever, and you wouldn’t have known this wasn’t “just juice” if you didn’t ask. Along with no choices, there are tickets rather than reservations. You pay in advance, and the restaurant knows exactly who is coming and when they will arrive. Again, this lets the cooks focus on the cooking. I understand Next has a brigade of 15, plus 6 morning-shift prep cooks. The waiter volunteered that the AM crew is the hardest-working prep crew he’s ever seen. An interesting little book, on chapter of which form the basis for the lovely 2009 movie with screenplay by Nick Hornby. This is the second of Barber’s books I’ve read; in 1976, Linda and I grabbed a copy of her first book, How To Improve Your Man In Bed, on a lark at 30th Street Station in Philadephia. Fancy meeting again! After graduating from Oxford, Barber found a job at Vogue for 14 pounds a week, and then was offered 16 by a struggling startup named Penthouse. 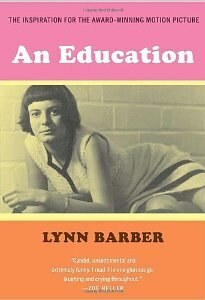 Later, she joined a variety of London newspapers, writing feature interviews with distinction. When Barber was 16, she met a strangely compelling, glamorous, and peculiar older man who swept her parents off their feet and their daughter into bed. Everything in the movie is here, but Barber’s style is so spare, honed by years of expertise as a magazine feature writer, that the written story seems slighter and even leaner than it is. So, Dear Jackass, I can only hope you didn’t realize your behavior was rude, selfish, insensitive, racist, or sexist. I’ll be at Readercon 23, and I think it’s best for everyone if we don’t see you there. It wasn’t immediately clear to me whether her complaints all related to the same person – the singular “jackass” seems to suggest it does, but I’m fairly sure that several different people were involved here. Moreover, the transgressions she describes are quite different, and I think it’s worth taking a moment to reflect on them, if only to remind ourselves what not to do. Asking silly questions. In one case, someone asked an e-book panel “Which indie publisher, specifically, will publish my illlustrated novel?” This is a silly question because no panelist can possibly answer it. In the questioner’s defense, it was a followup to a question, also ill-conceived, about illustration in ebooks, to which the panelists ought to have given a good answer, but (in my opinion) did not. Rating: a gaffe if you do it once or twice a year; a serious misdemeanor if you do it often. Ringing cell phones. Always a social crime, and this audience should know better. In defense, the guilty parties I noticed were women who lacked pockets and so could not have used “silent” mode. In a weekend conference, some allowance might be made for family emergencies. Rating: a misdemeanor in a conference. Worse in a concert hall or theater. Wrongheaded opinions. In the cases Cuinn mentions, I believe the opinions were sincerely held and concisely expressed, though wrong. One reason to attend conferences is to hear from people who are wrong; sometimes, they have a point and sometimes you learn to refute them. Asserting facts know to be wrong is a felony, but that’s not alleged here. Rating: no harm, no foul. Requesting an annotated bibliography. Not a crime, provided the request is polite and anticipates that the favor that might be inconvenient or impractical to grant. Rating: nothing to see here. Attacking and silencing your own panelists. I missed this session, which attracted notice elsewhere. Reading between the lines, I suspect that the moderator was arguing with the program chair who, I presume, had added some unwelcome additional voices to her panel proposal. This is not the way to do it: if you have a quarrel with the program chair, settle it privately or simply decline to moderate the panel and withdraw. Rating: felony, bordering on a high crime. Berating a writer at his own signing. Bizarre. A signing, it seems to me, is like a dinner party: if you go, you must be civil to your host; if you cannot in conscience be civil, you have no business accepting the invitation. Readercon signings are mostly tucked into a little corner far from everything. You would usually have to go out of your way to bump into one, so this is unlikely to be a chance encounter. Rating: temporary insanity under the stress of passionate feeling is the most likely explanation. So, we have six indictments, but perhaps only two real crimes, and I don’t think banishment (the punishment for high crimes) is absolutely necessary. The major violations seem to involve a dispute with the program chair, who in any case has the authority to enforce the appropriate sanction should that be desirable. I observe in passing that people are seldom taught how to attend conferences. Conference-going is a skill, requiring thought and judgment. In C++, I use lots of decorator objects that wrap simple data types and add lots of functionality or adapt their syntax. For example, in Tinderbox an SRect is just a rectangle and can be cast at whim to an old-fashioned Macintosh Rect, but it also knows how to to unions and intersections, how to draw itself in various ways, how to wrap text inside its boundaries, and so forth. The overhead for the SRect is 16 bytes for the rectangle and something like 8 bytes for the object overhead, so it’s effectively free. Dismantling the SRect when you’re done with it is completely free, because there’s nothing to do in the destructor. In Objective C, though, we have no stack objects. We have to create an object on the heap, and that object will eventually need to be (auto)released. SRect *mySRect=[[SRect alloc] initializeFrom: r];	// remember to release! In principle, allocating and releasing this object might take a lot of work. Tinderbox blithely turns SRects into Rects and back whenever it wants, knowing this to be fast and easy. In particular, nearly ever function in Tinderbox’s numerous LayoutPolicy and DrawingPolicy classes do this at every call. In C++, this might add up to thousands of microseconds for each view – a negligible cost. In Objective C, this might add up to thousands of small autoreleased objects. Is that negligible? It might be, if the allocator is sufficiently clever. How do you manage your decorated objects in Cocoa? Surely I’m not alone here. I’d love your advice. Email me. Having spent the last few weeks immersed in iOS – high time! – I offer a few observations. XCode 4 is an impressive IDE. Running on my new i7 MacBook Air, it’s delightfully fast. Integrating the Clang/LLVM compiler with the editor is a big win, even though it spends a lot of time telling me things I already know. Yes, this function doesn’t return anything. I haven’t finished writing it yet. As you can tell. Just wait half a minute while I finish typing. There. It’s fun to be working with fresh code again, even for small projects. Cocoa Touch, also known as UIKit, is an interesting framework. To avoid lots of subclassing, it embraces delegates (which other frameworks call protocols or policy objects) all over the place. This is a nice use of what Objective C does well. I miss overloading in C++. I really miss protected inheritance. Getting XCode 4 to talk to Subversion was a bear. It’s working now. I think. I’ve scant idea exactly what used to be wrong, or what’s right now; I think it might relate to an SSL certificate authority and Beanstalk. The Objective C idiom for private methods is to declare them in the implementation (.m) file, not the header (.h). I have a shelf full of introductory texts for Objective C and Cocoa. None of them highlight this. Offhand, this is one of the most important and obscure language issues confronting the immigrant from C++, or indeed from any good object-oriented language. Cocoa memory management is tricky, especially after an injudicious bit of documentation convinced iPhone coders that autorelease was a Bad Thing. You can’t avoid autorelease, so it can’t be a bad thing. None of my iPhone books (and I have a bunch) do a very good job with memory management idioms. Apparently, iOS 5 will make all this memory management headache vanish into thin air. On the whole, the Apple documentation is more accessible to the educated reader than are the numerous volumes from technical presses. This is a change from the way things used to work. Apple is its own Osborne, its own Petzold. A number of books about “getting started” with iPhone or iPad or Cocoa programming are badly conceived, being aimed at people who don’t have sufficient background to do the job properly. They try to explain object-oriented programming, memory management, and a complicated framework from ground zero. It’s one thing to explain syntax, but another thing to try to cram syntax and three years of computer science into 600 pages. Trying to learn to program UIKit is not a lot like trying to learn to program Commodore PET BASIC, but the books look remarkably alike. Stack Overflow isn’t half bad, half of the time. Here’s the latest update from the lab at Eastgate. 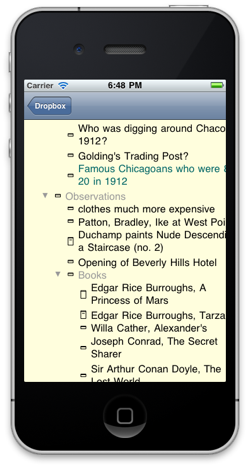 That’s a Tinderbox outline, viewed on the iPhone or iPad. The immediate goal is a viewer – a tool for browsing Tinderbox documents you’ve created on a Macintosh. To keep things light, we’ll probably have separate apps for Tinderbox and Twig maps and for outlines. Touch interfaces are new, so we expect lots of tinkering with exactly what gestures we’ll use and what they’ll mean. The small size of the iPhone screen is obviously a constraint, but I think this may well turn out to a useful tool for lots of people. There’s still lots to do. If you’ve got a critical application for something like this that can’t wait, though, you might get in touch with us at Eastgate. So, now we have a debt deal. Alas. He was not the man we thought he was. The worst aspect of this disaster is its confirmation that faith in magic is more important than knowledge, experience, and common sense. Unemployment is nearing 10% – the real rate, including the millions who have simply given up, is probably 16%. The government can borrow money for five years at negative interest, and for ten years at 0.4%. We should be borrowing more money and using it to build stuff that we’ll pay for in ten years and use for fifty. We should be borrowing more money and using it to employ people who would otherwise be idle, and who may now spend years – decades – drifting from one lousy part-time job to another. Instead, we’re going to cut everything (except the military) in order to avoid small tax increases for millionaires. We’re going to put more people out of work. The deal appears to be total capitulation to unreason without any glimmer of hope. On the one side, we’ve got experience and we’ve got economics. On the other side, we’ve got superstition and magic. We’re being governed by crazy shamans. I have not yet seen any rational defense.